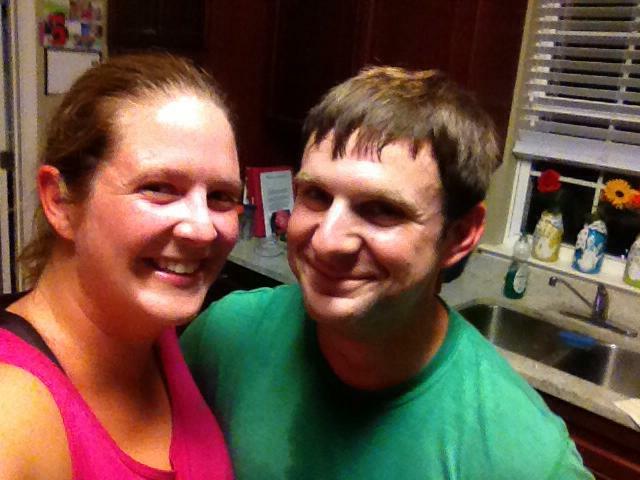 That would be my husband and I after finishing our first T25 workout- Alpha Cardio. This workout is 25 minutes long, and just packed with movement from start to finish- you seriously do not stop moving the entire time. I did my best to keep up, but did find myself having to do the modified movements quite a bit as well. The workout moved very quickly and was energetic and the time flew by, though there were moments that it seemed to last forever. It was a good workout and we both felt like we got a lot out of the 25 minutes. Then, last night we had our first encounter with Speed 1.0. This one was a combination of speed, stability and flexibility. I thought this one was harder than the Alpha Cardio even though there were times when you were doing a stability or flexibility move that actually provided a moment's break from the constant movement. My husband disagreed with me- he thought it was an easier workout than the cardio. Today's workout will be Total Body Circuit.......I'm definitely feeling a little sore from the past two day's workouts, so we'll see how it all goes!